If you want a quick and inexpensive project to make for yourself or to give as a gift. 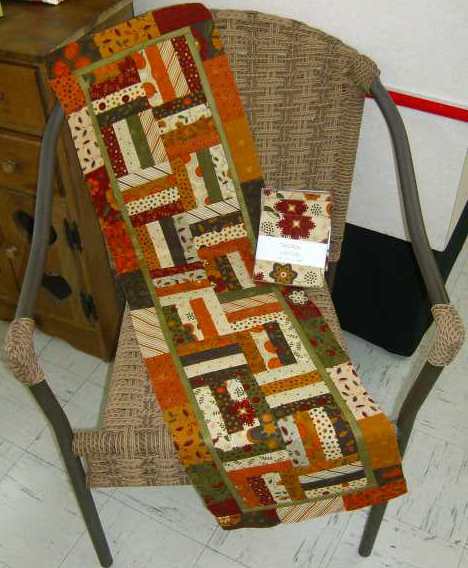 Then this is for you.This table runner was made from 1 Gobble Gobble Charm Pack and 1/8 of a yard fabric, that’s it. The pattern can be found at the Moda’s Bake Shop. The pattern is a free download and the name is Petits Fours. You can use any charm pack . This entry was posted on Tuesday, July 21st, 2009 at 12:58 pm and is filed under Uncategorized. You can follow any responses to this entry through the RSS 2.0 feed. You can leave a response, or trackback from your own site.